Here you will find resources to help promote the World Positive Education Accelerator to your network. We have all the information and graphics you need to promote via your social media, email and website. Thank you for your continued dedication and support! Subject Line - Largest Positive Education Event of the Year! We are thrilled to partner with the International Positive Education Network (IPEN) and Champlain College to redesign global education. 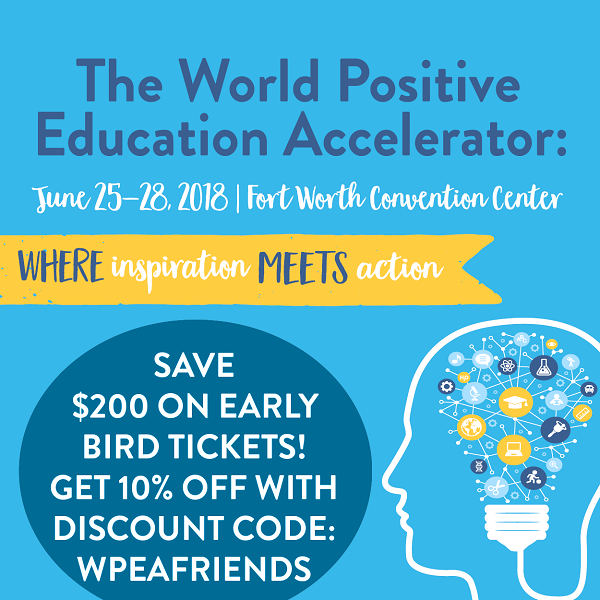 The World Positive Education Accelerator (WPEA) is the first of its kind—integrating IPEN's second Festival of Positive Education with the David L. Cooperrider Center for Appreciative Inquiry (AI) methodology. Worldwide delegates will turn inspiration into action with a full day of festival speakers, breakout sessions and networking activities followed by a 3-day AI Summit. 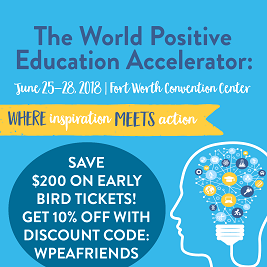 The 2018 WPEA will elevate the inspiration and ideas of 1,200+ stakeholders including educators, researchers, practitioners, positive psychologists, policymakers and others interested in academic achievement and character virtue development. Festival content developed and delivered by education’s leading innovators, influencers, practitioners and business leaders.